Polly Ngale belongs to the oldest living generation of Utopia women and is considered one of the most accomplished painters to have worked there during the past twenty years. Polly's artistic career began in the late 1970s when she, like many of the women in Utopia, began working with silk batik before venturing into works on canvas. 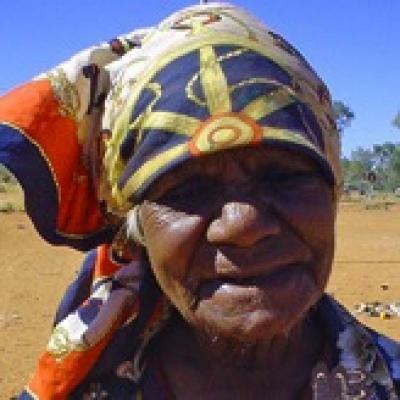 Polly is one of the most senior custodians of her country Aparra, in the heart of Utopia. She shares this country and the Bush Plum (Arnwetky) Dreaming with her sisters Kathleen Ngale and Angeline Pwerle Ngale. Like Kathleen, Polly creates her paintings by building up layer upon layer of colour to create multi-dimensional images. The two have often collaborated and painted together. Many of Polly's paintings depict the bush plum and its bright yellow seeds in its various stages of ripening, or the topography of the land in varying shades of red, orange, and yellow to reflect the changing colours of the seasons. Other works depict designs associated with Awelye, women's business and ceremonial law.